The Battle Ground Hotel Museum is located on the hallowed grounds of the Lundy’s Lane Battlefield. The building was bequeathed to the City of Niagara Falls on the death of the prior owner, Ruth Redmond. She was a retired school teacher who purchased buildings on Lundy’s Lane in order to preserve our heritage in the face of modern development. The restored 1850’s tavern displays furnished period rooms and artefacts from the War of 1812. Visitors to the site are given a presentation about village tavern life and early tourism’s fascination with the famed battlefield. The Battle Ground Hotel Museum is the only illustration of a 19th Century inn which exists as a product of the commemoration of the War of 1812, and also as an element of early Ontario tourism. A tower with an observation deck used to be on the property from where early tourists who came to visit the battlefield could have a better view of the area. A guided tour at the Battleground Hotel Museum will transport you back to 1850’s tavern life in the quaint town of historic Drummondville. 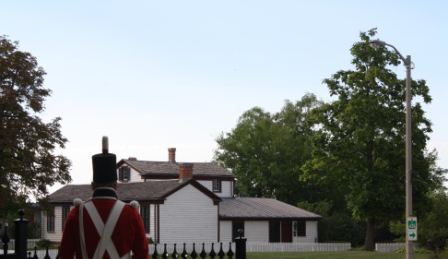 This small town thrived from its proximity to the falls and its location on one of the bloodiest battles fought on Canadian soil. The tavern remains as one of the earliest examples of Niagara Falls Tourism as many tourists came to see the battlefield of Lundy’s Lane. Adam Fralick even built a wooden observation tower where people could pay a fee to see the entire battlefield. Visitors to the museum will have a chance to visit various restored rooms throughout the building like the Lady’s Parlour. This room was considered a safe haven for children and socially acceptable women to congregate.During this time period, the consumption of alcohol and tobacco were socially frowned upon for women, hence the attempt of a physical separation between the two sexes. A few things to note in this room would be the feminine décor of the room as well as the ornate tea set that indicated social status and wealth. The foyer with the entrance that faces Lundy’s Lane allows visitors to the museum a chance to see where the innkeeper would have received guests to the tavern. Also in the room are relics from the battlefield, regimental buttons and an original quest registry book from the observatory (circa 1835 to 1856). In the 1850’s, the Tap Room was the place to be where men could have a drink, listen to music and debate politics and economics. Compared with the Lady's Parlour, the furnishings are quite bland with the absence of wallpaper and smooth flooring. However, there are a few unique features like the bird caged bar that operates on a pulley system and the cast-iron stove with a network of flues to warm the house. The kitchen was what a typical kitchen would have looked like from the 1830s-1840s. Food was generally regarded as poor. Although consuming alcohol was the main activity, evidence suggests that eating was also considered another popular activity. Main meals included beef, pork, rabbit, turkey, chicken and even passenger pigeons before their extinction in the early 20th century. Visitors will also be able to see the pantry where they used to store food and dishware. One of the main features of this room would be the unique design on the walls that is similar to the “sponge painting” design that gained popularity during the 80’s. In the heart of the house lies the innkeeper’s room where it features typical furnishings of the time period like a rope bed and a cast iron strong box. With all the history that surrounds this area where The Battle of Lundy’s Lane was fought, it is surprising that the grounds were almost lost. However, with the efforts of Ruth Redmond who was a schoolteacher at Stamford Collegiate, she preserved the properties around this area and kept the legacy alive for generations to come. The City of Niagara Falls has opened the building to the public and maintains the site. Guided Tours: We offer guided tours to groups and which must be booked in advance. Parking: The site has no on site parking however, there is ample parking within a 2-5 minute walk. Parking is available at city lots at 6002 Lundy's Lane and off of Drummond Road. As well, there is parking on Hanan Avenue. Wheelchair Accessibility: The Museum is partially accessible. There is access to the room at the Museum entrance. Paths to the building are crushed stone. The site has no onsite parking, however the City of Niagara Falls has two parking lots within two minute walk of the Museum. One is down Lundy’s Lane just past the Cemetery and the other is on Drummond Road south of Buchner. The Battle Ground Museum is also a four minute walk from the Niagara Falls History Museum.